Stunning custom home with approx. 4000 sq ft for your family! 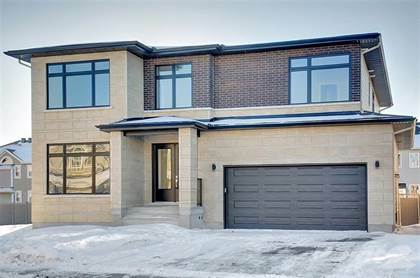 This new home has high-end finishes, 9 ft ceilings on every floor, natural light and a great outdoor space! The main floor features, a spacious formal living rm with fireplace, large dining room, and office. This luxury kitchen comes with high-end appliances, granite countertops, and clear sight lines from the kitchen to the living room. Off the kitchen is the dining rm with a beautiful view of the spacious backyard. The upper-level master suite welcomes rest and relaxation with a 5-piece ensuite which features a standing shower, soaker tub, & his/her sinks. Two walk-in closets and a three-sided fireplace complete this master retreat. Bedroom 1 & 2 have a Jack and Jill bathroom, and the 3rd bedroom has a 3-piece ensuite. Not a detail has been overlooked! The lower level can be finished at the buyer's request for an additional cost. Photos provided are of a similar home, this home is to be built. Hi, I'd like to find out more information about 2218 Webster Avenue. Thanks so much!